Estimated to have been built in the 1880’s, this gasthaus is one of the few historical barns in the area still standing. It was part of the original homestead of the Schlaudt Family where it remained in their family until 1994. It was eventually restored by your host who achieved her vision of adding modern amenities to the building while retaining its rustic charm by keeping the exposed cypress beams and native rock. The original features of a working barn are seen throughout the gasthaus, but the comforts of home have been added. An antique door headboard functions as a headboard wall for the King size bed that is adorned with country quilts and pillows. An original stall gate is featured as a headboard on the Queen bed in the Green Room. The vintage lighting and an old wood stove used as a nightstand gives this room its unique character. The “all new” bathroom was constructed in the stall area next to the King bedroom. The centerpiece of this room is the 1917 six foot claw foot tub and the romantic crystal chandelier. Guests have the option of relaxing in the wonderful tub or using the large walk-in tile shower. 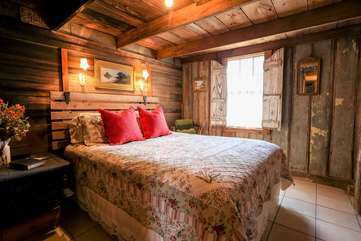 The third Double bed is located at the end of the long main living are which is decorated in a vintage western them. This area features rock walls and has a comfortable seating area including two wing back chairs for visiting and watching Dish TV. There is also a table and chairs in this room. A breakfast of assorted German pasties is left for you on the hanging porch swing between 7-7:30am by your host. Evenings can be spent on the porch swing, enjoying the wildlife this country barn has to offer. Enjoyed our stay! Loved the way the turn of the century barn was transitioned into a B&B!! Very cozy atmosphere!! Pastries delivered to the porch swing every morning was a great touch and delicious! A fun holiday reunion with family in Texas. Very different from my residence here in Hawaii. Fun.. It was a fun, rustic, intimate experience in a very historic and old fashioned retro-environment. I would recommend it to anyone who is looking for a unique if not eclectic experience. Would recommend arriving early and before sunset as it’s hard to see the entry way at night. Darling barn turned into a cabin. This is the cutest little place about 2 miles just outside of Fredericksburg. It was an old barn converted into a cabin. There are 2 bedrooms and 1 bathroom with a walk-in shower and separate claw foot tub. It also has a partial kitchen with a mini fridge, microwave and sink. The owners keep it pretty well stocked with salt, pepper, sugar and spices, coffee, tea and a few snacks. Every morning we received breakfast pastries that were left on the front porch. She also offers bath products, a hair dryer and even curling iron! The decor is a collection of western and antique items ...eclectic and fun. The bedrooms are both a decent size and there’s even a third bed in the living/dining area. The cabin opens to a large grassy area with beautiful views of a few surrounding properties. It is off 290 by a matter of feet so you can hear cars passing. But unless you’re a light sleeper it isn’t bad ... neither of us had trouble sleeping. And there’s a sound machine too if need be. Storage is limited .... the rooms have a few hangers and hooks but that’s about it. It wasn’t a problem for either of us when we went and the rooms felt fairly large. It’s actually surprising how spacious it is inside, especially at first glance from the outside. The only con, as I said, was a bit of background noise but it wasn’t bad for us. We would have enjoyed having a fire pit to use at night. They really make you feel appreciated w/ several personal touches. We loved it! A group of 5 pals went for a birthday weekend getaway. We grilled out one night under the Texas stars, and the breakfast pastries on the porch sealed the deal--delicious and fresh from a local bakery. Our hosts answered our questions and were absolutely lovely. We loved the charm of the place and felt right at home!